Interview season is upon us, causing thousands of potential occupational therapy (OT) students copious amounts of applying to OT school. Once you get the interview, you worry about what to wear, how to prepare for the weather (especially if you’re living in harsh winter climate), transportation and what to bring with you on interview day. Most importantly, how do you make an impression in the short amount of time that you are actually being interviewed? Preparation! If you study up on your interview questions beforehand and practice responding to questions, this could potentially lessen the stress of an interview in the moment. You don’t have to worry about rambling or blanking when you have prepared or at least thought about how to respond to potential questions you could be asked. While you can’t possibly be prepared for every question that an admissions committee might throw at you, you can certainly prepare for some of the most common interview questions that many educators expect you to be able to answer. Here are 7 interview questions that YOU should be prepared to answer on interview day. So why is this a golden ticket question? The floor is yours. This is your chance to make yourself remembered. It’s your time to go from a name on a resume to a real person the admissions person can see as a student in their graduate program. Try to separate yourself from the crowd while also wrapping up your qualifications neatly into one response. You want to sprinkle in references to your resume and qualifications, but don’t just talk about being a dedicated student or workaholic; talk about your passions and your values. In other words, tell your interviewer something that they wouldn’t know just by looking at your resume (which they may already have in front of them). Talk about some of your roles outside of LinkedIn (sibling, parent, caretaker, photographer, athlete, etc.). Try to find a balance between highlighting some of your best qualifications while also humanizing yourself with some tidbits that make you unique. 2. Why OT? Why not PT? This a pretty loaded question. First, the committee is looking to see that you grasp what OT actually is. They also want to see that you can articulate the difference between our cousin profession that many people struggle to discern. A common misperception is to claim that OT does upper extremity and PT does lower extremity. This doesn’t appropriately distinguish the two professions, nor would it appropriately explain why you would be passionate about OT over PT. Use buzzwords such as client-centered, holistic, and meaningful occupations — and demonstrate that you understand the terms! This will show the committee that you have done your homework beyond just shadowing, which is often just a snapshot of what OT does without any real education on why. So, study up on the difference between the two professions and incorporate some examples from when you have shadowed. 3. How would you define OT to someone who has never heard of it before? This was one of the questions I received during interviews, along with “What is OT?”, which is essentially the same question. This is an important question to all interviewers because it is an incredibly common question that arises when you meet new clients and you will undoubtedly be explaining what OT is all throughout graduate school. 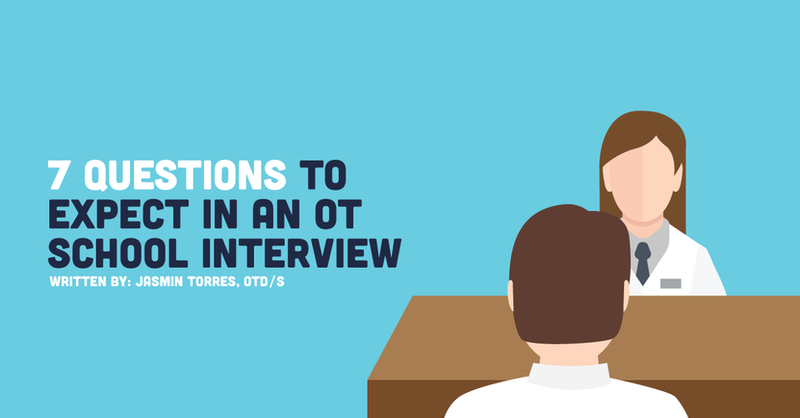 Keep in mind that interviewers know that you are not an expert in OT yet. You’re not expected to give the perfect answer as if you have been practicing your elevator speech for years, but it is important for the committee to see that you can confidently articulate a professional response. When defining OT to someone who has never heard of it before, you want to use everyday language that makes understanding OT seem simple. 4. What are some of your interests outside of school/work? This question is similar to question #1, but it allows you to dig deeper into what activities you actually participate in when you’re not a full-time student or professional. This question might seem like it has nothing to do with OT, but admissions want to see that you are well-rounded and can cope healthily with stress. It also helps them individualize their applicants and look for stand-outs. As an OT you will be looking at all activities of daily living (ADLs), so you can think of yourself as a client in this situation. To help reflect on this question, what are the things that you do when you’re not studying for class or working? How do you de-stress? What are some of your hobbies? Make a list and have this ready as you prepare to answer this question. 5. Tell me what (insert OT shadowing experience here) taught you about the OT profession. Be prepared to share some of your experiences and observances that you made while shadowing. Admissions want to see that you can reflect on these experiences and that you were able to take something away from other OTs. If you have observed different love OT so much! 6. What are your best and worst attributes? This seems like a pretty straightforward question to answer, but you definitely want to be prepared to answer this question and don’t want it to be inauthentic. When thinking of your best and worst qualities, try to circle them back to how they would impact your future occupation as a graduate student. Even “negative” attributes can be spun to be something productive and positive or can at least be reflected on as something to improve upon. This is another question that lets the committee get to know you as a person and potential student and can be used to help you connect with the faculty member who interviews you. 7. Tell me about your leadership experience. Being asked about leadership experience can be intimidating if you don’t have anything on your resume that explicitly says executive board. This is where you can be creative and draw on some of your life experiences that may not necessarily have been captain of your sports team or president of a club. Think about times you have worked in teams, situations that you took control of when conflict arose, or situations where you tend to take charge. A personal anecdote will make you even more memorable to the admissions committee! How to ace your OT school interview: preparation, preparation, preparation! Preparing for interviews is always intimidating, but hopefully these questions help you feel more confident on your big day! Remember to remain true to yourself and try to let the conversation flow naturally. Don’t worry too much about looking nervous — interviewers understand that the process is stressful and nerve-wracking. Plus, nerves are healthy! They show the committee that this is a career and program that you care about. Some people are more comfortable preparing for interviews than others. Whether you spend the night before skimming some questions or the week before going through mock interviews, make sure that you prepare just enough to calm your nerves. Regardless of how much you decide to prepare before interview day, have confidence in your ability to convey who you are during your interview. In a health professions career, evaluators want to see that you are a caring and compassionate person. You’ll convey this best when you can be yourself and honest in your interview process. By putting on the mask of someone you think you should be on interview day, you aren’t giving yourself a fair shot. At the end of the day, do what makes you feel your best and prepare for your new journey in OT school!